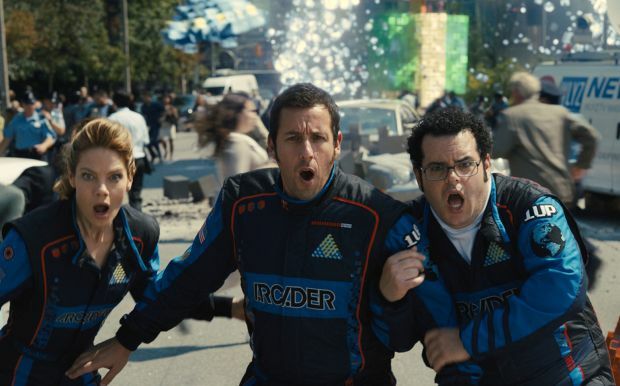 NEW YORK (CNS) — All those misspent hours of youth, spending quarters on mindless video games, are finally put to use in “Pixels” (Columbia), a manic comedy about an alien invasion of Earth by 3-D characters from the arcade. As kids in the 1980s, this quartet saved the world thousands of times — at 25 cents a game in the arcade. Now rebranded as the “Arcaders,” they face their pixelated friends in real time, with a few modifications. The film contains bawdy humor, some sexual innuendo, and a few mild oaths. The Catholic News Service classification is A-III — adults. The Motion Picture Association of America rating is PG-13 — parents strongly cautioned. Some material may be inappropriate for children under 13.